This entry was posted on January 31, 2017 by Mari. Their easy care and decorative red coloration have made Red Cherry shrimp (Neocaridina heteropoda) one of the most popular dwarf shrimp species in the hobby today. Aquarists looking to get into Red Cherry shrimp keeping and breeding might be surprised to learn that there is not just one type of Red Cherry: various intensities of red are graded, priced and named differently. Keep reading for everything you need to know about the different Red Cherry shrimp grades and how to recognize them! When figuring out what grade a Red Cherry shrimp is, there are a few basic rules to keep in mind. The redder, the better - Red Cherry shrimp grading is all about red. A shrimp with a larger amount of red and higher color intensity will fall into a higher category. Opacity is important - Higher graded Red Cherries will have more opaque bodies without translucent splotches. Males and females differ - Male Red Cherry shrimp are smaller and less brightly colored than females. So while a female might fall into the highest grade, a male sibling could end up a little lower on the ladder. Red Cherry grade shrimp grades range from Cherry grade (lowest) to Bloody Mary (highest), though breeders are always working on new varieties. The lowest Red Chery shrimp grade, Cherry grade specimens are mostly translucent but have some spots of light, pinkish red on the body. They should be easy to find and are quite cheap compared to some of the higher grades, which makes them a great option for beginners or anyone just looking for an effective aquarium cleaning crew without special looks. You can buy Cherry grade Red Cherry shrimp at The Shrimp Farm! Sakura grade Red Cherry shrimp have a lot more red than Cherry grade shrimp and the color should also be a bit darker. They are not close to opaque, though: the red coloration is still quite blotchy, especially around the bottom. Legs are still (almost completely) translucent. A good option for anyone looking for a pop of color in their tank but not too concerned with color quality. 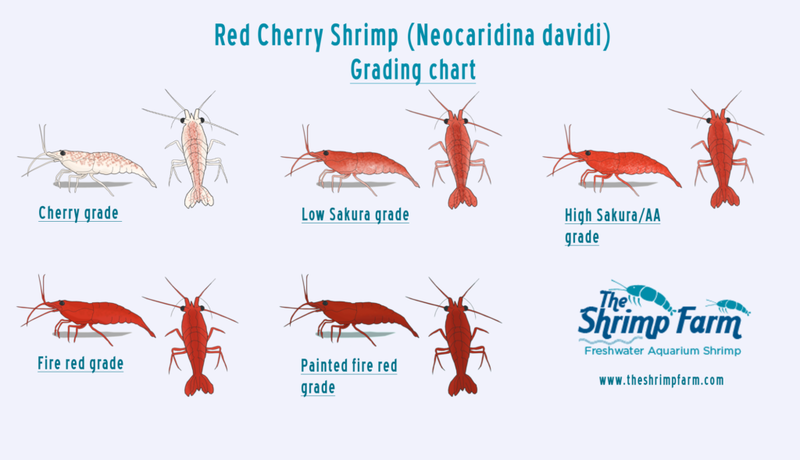 Some charts place low and high (AA) Sakura grade Red Cherry shrimp into the same category, naming them simply "Sakura shrimp", but this does leave quite a bit of quality difference within a single grade. Dividing the Sakura grade into two separate categories can help prevent confusion. High Sakura grade (AA) Red Cherry shrimp are more opaque than low Sakura grade specimens and color is usually more intense. A difference can also be seen in the legs, which show some blotchy coloration the lower grades don't have. You can buy Grade AA Red Cherry shrimp at The Shrimp Farm! Arriving at the intensely colored Fire red grade, we see shrimp that are almost completely opaque. The eggs and saddle were still quite easy to see in the lower grades but coloration is so strong now that they are getting difficult to spot. Fire red grade Red Cherry shrimp have evenly colored legs with no blotchiness. A great option for aquarists looking to seriously get into Red Cherry shrimp breeding. You can buy Fire red grade Red Cherry shrimp at The Shrimp Farm! Painted fire red grade Red Cherry shrimp have earned their name from their very intense color that almost seems painted onto the shrimp; eggs and saddle are invisible unless a strong backlight is used. The color is darker than that of all the lower grades and absolutely no translucent spots are visible. Painted fire red grade shrimp are beautifully colored but can be quite expensive. If you don't want to pay for a colony you can selectively breed them from the lower grades, though this does require some expertise. Bloody Mary Red Cherry shrimp are not included in all charts yet and a relatively recent addition. 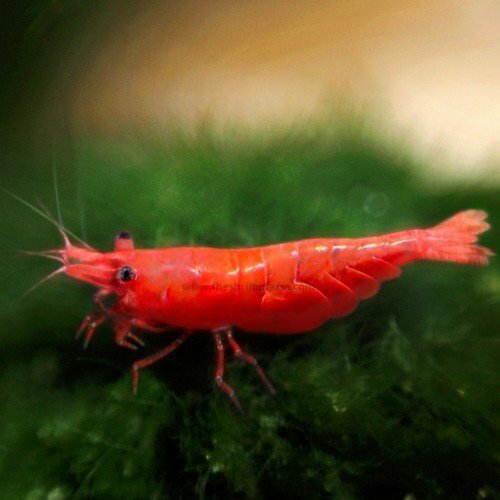 Their color is similar to that of Painted fire red grade shrimp but even more intense. Even the males will be very intensely colored and opaque, which isn't the case with most of the lower grades. This grade is also known for having a shorter rostrum ("nose") than other Red Cherry shrimp. In addition the Bloody Mary line can be traced back to Chocolate Shrimp, meaning they are a variation bred from a Chocolate Shrimp line. Bloody Mary Red Cherries can be very expensive but hobbyists agree their extremely vivid color makes the price more than worth it. There's a lot more to Red Cherry shrimp than one might assume, which makes keeping and breeding them all the more interesting. Don't forget, though: the most important thing is to enjoy the hobby and keep healthy shrimp. A full Red Cherry shrimp caresheet can be found here. If you're interested in starting your own Red Cherry shrimp (breeding) colony, The Shrimp Farm can help: we deliver various Red Cherry shrimp grades right to your doorstep. Algae eating shrimp | 3 algae eating champions! What do alder cones have to do with your shrimp?